Cybersecurity frameworks like SOC 2 are designed for SaaS and other cloud-based solution providers and when used properly helps secure your organization, builds trust with clients, and supports the sales of your products and services. Yet, SOC 2 contains over 60 requirements to mange and report creating a huge challenge for SaaS companies of all sizes. Here are four reasons why SaaS companies are automating SOC 2 compliance. As a SaaS company, your customers and sales prospects are constantly questioning your company's security. They want assurances that their valuable data will be protected and that you have a robust security program to do so. Of all of the industry frameworks, SOC 2 is one of the most comprehensive on data privacy and cloud security so it's no surprise that it's emerged as the de facto standard for SaaS companies. Usually, your security team is asked by sales to fill out a security questionnaire or to participate in phone call after phone call prove your company's security. Compliance frameworks are challenging to implement and SOC 2 is no different. Trying to understand and implement its requirements can be confusing, even for experts. SOC 2 framework has a total of 61 individual compliance requirements covering areas such as policies, access control, training, vendors, and incident response to name a few. Take Control Environment as an example - its requirements include commitment to integrity and ethical values, board of directors independence and oversight, entity structures, reporting lines and responsibilities, attracting, developing and retaining competent individuals, and accountability of responsibilities. Think of these as individual projects you need to interpret, assign, track, manage and report on - 61 in total! There is currently a huge talent shortage in the cybersecurity industry. According to Forbes, there will be "as many as 3.5 million unfilled cybersecurity positions by 2021." As a SaaS company leader, you're focused on growing your recurring revenue and driving innovation without enough people to help you reach your SOC 2 security goals. Cybersecurity skills combine a hybrid of traditional IT skills (programming, analysis, coding, et al) along with intelligent cyber-detective work that relies on intuitive problem-solving skills, blended with cyber-tracking and system maintenance expertise. Most SaaS companies cannot afford to hire a resource with these skills, which means they end up pulling in IT resources from other critical projects and departments to work on security initiatives part-time as a stop gap. Many SaaS companies are still using Excel with multiple workbooks and complex formulas to capture and retain crucial information about cybersecurity compliance controls. 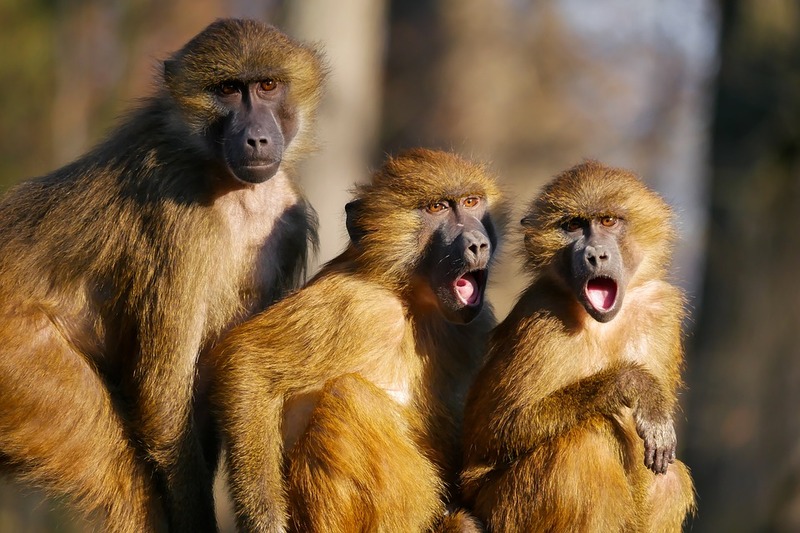 This dumps hoards of Excel workbooks in file shares and hard-drives...all with critical information about their company’s cybersecurity posture sitting in disconnected silos. When cybersecurity is being managed in Excel it can take days and weeks to pull the information together for customer audits and due diligence. Excel was invented in 1985. It's time for an upgrade. Apptega is helping SaaS companies of all sizes build, manage and report their SOC 2 programs more efficiently and cost-effectively than any other approach. We've taken the 61 SOC 2 requirements and organized them into an easy-to-use, centralized platform that guides you and your team through the entire SOC 2 program with real-time compliance scoring, project lifecycle management, tasking, calendaring, alerting, vendor management and one-click reports for customer audits. Your customers are demanding SOC 2, it's hard, there's not enough security talent, and you're sick and tired of Excel spreadsheets. Apptega was created for SaaS teams just like you. Want to learn more? 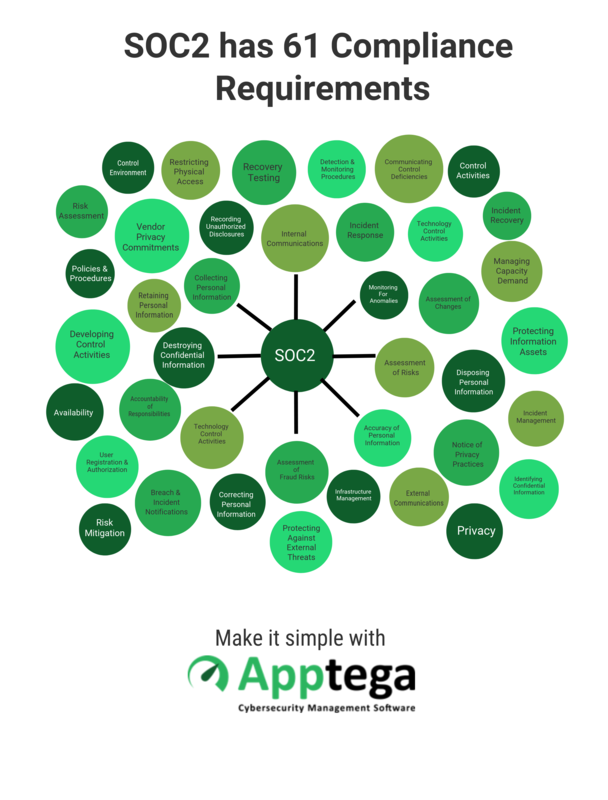 Click here to schedule a demo to see the many ways Apptega makes SOC 2 compliance simple.